Welcome to the Brookshire Meadows Out of Character discussion thread. We are a join-by-request neighborhood, so you need to ask in here before you join. Please read the important info of this first and follow the directions to join. Every character has their own color when they talk, so its easy to tell them apart. Every notable character in the RP is listed here, including non-pet characters. Humans are Underlined, animals who are not main-characters are Bold. - Dr. Roll N. Stones (Dr Stones) - East Brookshire Community Vet. Runs a small animal hospital near the development. Has nurses too. Lots of things have happened so far, so I broke it down into arcs for anyone who wants to read or refer back. Each has a Name, Description, and list of main characters. - The Barbecue arc: This part is sort of happening all day with other stuff around it, so I broke it down into sub-arcs. - - Shooting Things (for fun!) - The pets at the barbecue shoot things in the underground shooting range. - - The obvious happens. - Someone put the grill in the kitchen and just sorta left it there, still going, and it OBVIOUSLY starts a fire. Everyone panics! Zuchinni is killed in creative ways as a running gag. When he dies, no one seems to notice. He reappears later, unharmed. This is an ordered list of who's killed him and how. 1 - Ranger Jack - Ran him over with a truck on the way back from the mall, thinking he was a pothole. 2 - Sid - Ran into him while leaving Enya's concert, getting his head stuck in a bowl full of molten cheese, where he drowned. 3 - God (aka, the GM) - Was on Shep and Robert's roof, holding up a disassembled lighting rod, when the lightning rod worked. These are all important, so know them well if you're in this neighborhood. - We are a Join-by-request neighborhood. That means that to join, you need to get permission from us. Follow the directions below to join. Don't worry, this isn't so much to filter out characters as to keep confusion down. - Give others a chance to respond. This is really annoying, especially in the middle of the day/morning. (American time) Not everyone can be on at all times, and when you start leaving people's characters behind, it's a problem. If someone takes less than a day to post, you need to wait. Only when it's been several days is it acceptable to do something to free up your character. - This is a Democracy an Anarchy, not a Bureaucracy. Unless there's a rule being enforced, or some opposition, anything (within the rating limit) goes. If you want to do something because you think it's fun, go ahead. - WE USE IRC. It is not required that you use it, but you're going to get left out of alot of stuff if you don't use it. It also means we post alot every night (American time), because we coordinate. - Watch the OOC thread. Stuff is constantly happening in here, so if you aren't watching, you're missing RP-important stuff. - Note the Structure: I try and keep some sort of structure in this neighborhood, to who's in what "group", what's happening in what "arc", and what "day" and "season" events happen in. Keeping that in mind might be useful to avoid confusion when trying to understand what's going on. 1. If you want to join, you need to post a sheet in the Main OOC and then come in here. 2. Link a fully fleshed-out character sheet so we can all see what you're bringing in, and maybe add a few words on what you're bringing into the neighborhood. 3. At least three people who are already settled into the RP need to agree to you joining. - Amendment: this step hasn't served much use, so at this point, you don't need approval, just a lack of disapproval. I encourage players who are currently active to look at the new sheets that are being posted and voice any concerns, objections, or suggestions they have. 4. They need to be ready to answer any questions or concerns from current members before they continue. 5. They will then be assigned a color for their character. In BsM, we've decided on some things which aren't fully explained in the comic by doing them here. Here's a reference to the things we've used. - Pets have "boyfriend/girlfriend" relationships which are just for fun. Wild animals have mates, and that works like it did in the middle ages: They start looking when they are 4 and are trying to find someone to have children with as soon as possible. - Forest Predators are not dangerous, but that's not widely known. All the wolves in the preserve have been sternly warned not to attack any human or animal with a collar, and thus, they are afraid of them. - The East Brookshire mall is big, and not far from the Brookshire Fields development, which is on the east edge of town. It may be the only mall in Brookshire. - Pets have alot more rights in this state than they do in the state that Richardson Valley is in, and certain things which come up there (eg. neutering) aren't even considered in this state. Michigan has a rule that says an animal that is sent back to the shelter 3 times can be put down, but that isn't the case in this state either. Brookshire has passed some particularly pet-friendly laws, which became popular after the city's small businesses reported a lasting boost in their earnings. - Yorkshire is the nearest big-city, while Brookshire isn't much of a city at all. They have a larger pet-hospital. - Yorkshire is rapidly expanding, encroaching on the surrounding wildlife, causing an ecological meltdown. Wild animals in the Yorkshire are less friendly and do not socialize with each other anywhere near as much. The Mountain-lion which Rikki and Jack fought and Darin the wolf pup came to Brookshire as a result of the meltdown. - Human hunting in the preserve is illegal, and hunting laws everywhere are presumed to be stricter than IRL, quite simply because it's alot less likely to be legal to kill an animal that can beg for mercy and has friends which might take revenge. In early 2012, we merged Yorkshire back into Brookshire Meadow's frame of reference. Because that can be kind of weird, here's the special rules on that. - Yorkshire is a few miles away from Brookshire, which means that characters can't simply walk between the two towns, but can easily drive back and fourth in 15 to 30 minutes. - Yorkshire only recently copied Brookshire's Pet Friendly laws, which have been in place for a few years. Thus, characters in Yorkshire are likely to be less used to them. - Anything that happens in Yorkshire happens in our thread, but it should clearly be happening in Yorkshire, and there shouldn't be constant crossover. Ok, so I started the neighborhood as Buckdida told me to, so I'm going to open the OOC too. I think the first thing that we need to establish is who lives here and what the neighborhood's like. Right now I'm really into the idea of having it share an edge with a nature preserve, as that's good material. Anyone else have thoughts? Edit: I have an idea, maybe we should post (possibly shortened) copies of our character sheets here (after making complete ones in the main PF OOC) for easy reference. Here's Rikki's. Appearance - Pretty much a large, Gray and brown, North American Raccoon. Only interesting feature is an old scar on his upper left leg. He looks a little older than he is, because he grew up feral and still lives in the wilderness. 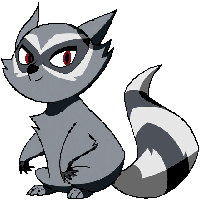 Personality - Rikki is a bit of a wild trickster. Having been born a feral, he has a tendency to act undomesticated at times. Other - Lives with Ranger Jack Calvin. Last edited by RockstarRaccoon on Sat Jun 02, 2012 4:06 am, edited 134 times in total. Hmm, well since its on the edge of a nature preserve, maybe we could go for a sort of Civilization style go? Like, the neighborhood is sorta parked, but it could be the jump-off point for a bunch of expedition into "The Wild" (ie: the nature preserve) where pets could romp around, play make-believe with interesting looking trees and ferals, and occasionally band with said ferals to fend off lobbyists who want to chop the forest down for paper? Edit: Yeah that's a good idea about the character sheets, I think that's what they're doing on the other threads too. Edit2: Also, I'm liking the new neighborhood and am thinking of "moving in" with a different character, fyi. Last edited by FunkyChickenFace on Mon May 31, 2010 6:53 pm, edited 1 time in total. That's kinda what I was thinking. It'd be great for the setting. Well, Buckdida wasn't into the idea, but if you like the idea, then edit that post to contain it. It's sort of a vote-by-action thing. Edit: Also, alot of talking is going on in IRC, so it might be good to join. Appearance - Cale is an all orange cat with lighter orange stripes covering his body as well as his stomach and face. He has Blue/Green eyes with a red collar that has a small skateboard tag. Last edited by Neko on Fri Jul 02, 2010 6:22 pm, edited 4 times in total. Hey Neko, nice characer. Now some else should post in the RP thread. So anyway, it sounds like we're in agreement on the nature preserve. I think it should be to the east of the town, and have a road and fence between it and the house. Anyone mind if Rikki is the Ranger's pet? It works for his backstory. So, beyond that, I think we should add a park of some sort in the center/western side of the residential area (the kind with swings and all that), and then maybe say there are shops and things to the west. How's that sound for a layout? Ok, so this is a simple image for my possible layout in my head. Edit: I think I should slow down for a second, 'cause there's only 2 other people posting, and I already have a map. So everyone else go ahead and comment, I'm waiting for a bit. Edit: I have an idea, maybe we should post our character sheets here for easy reference. Here's Rikki's. Last edited by Atari on Mon May 31, 2010 8:48 pm, edited 2 times in total. Incorrect. See the first post for the real list. Edit: Just to make sure you know, this is Brookshire Meadows (BsM for short), the new one. Not RV or RG. Edit: Move K-bar? Hmmm.... that'd be interesting to say the least. I'll have to go and erase my presence from Radiant Gardens somehow... OOH! MAGIC- *gets shot by all players* Sorry, just kidding. I'll probably have K-bar make regular appearance but not actually move in. However, I've got a cousin of his (on K-Bar's father's side) who's moving in (need to finish character sheet!!) and they have similar personalities. No bombs though, which is probably a good thing, considering this is a nature reserve. You don't have to move him, I just thought he'd be cool here. Go ahead with whatever you're doing. Frank was forced to leave The Queen Nips back at Chicago. He is subsequently putting together a small musical group and offers occasional performances when the mood strikes him. Pay him in catnip. Note also that he has enough catnip to last him awhile and is subsequently unlikely to offer legit concerts for more catnip. Instead, he’s prone to spontaneous renditions of Sinatra songs on street corners for absolutely no reason except that he feels like singing. These instances are free. NOTE: Just in case Frank decides to give a performance, he would like to know if it should be at the Park or at an undeveloped sector. Oh, so Rikki is that way too! I shall inform K-bar. He will be ECSTATIC to have a regular bomb-buddy. Also, DarkHeartsAndSuch has expressed an interest in making a character here. He literally said: I'm too tired right now but I'm reserving a spot!! I'm not sure if you knew or whether or not it matters if I tell you, but I figured it couldn't hurt. Ok, it looks like we're coloring our text. So I'd like if we all decided on colors for each character. I'll add that info to the character list as it comes. Edit: oh, thanks for the tip. I'll watch for him. Last edited by RockstarRaccoon on Mon May 31, 2010 10:22 pm, edited 2 times in total. I'll be using This Color for when My character speak/thinks. Ok. This is Greenish Gray, which hasn't been called, so that's fine. No. A similar shade of Blue has been called. Look at the list on top. This is far too bright. I cannot read it. Try This shade of purple. The code is #7070D0. Also, I worry about your character being a little too over the top. He's fine so far, but make sure he has some level of emotional depth, because alot of things can happen in an RP that centers on both action and drama. Edit: when you see this. Go back and change the stuff to that color, I'll add you to the list when you decide on a color. How about this dark, dark blue? Also, thanks for the heads up. I'll be sure to keep him on the down low. I was thinking that'd he'd be a sort of ladies man, but since he's moved to Brookshire he's sorta run out of ladies to woo (no female cats *sadface*). So unless somebody joins with a female feline, he'll probably not be doing much in the way of acting out. Too dark. Just use #10208A. That seems to be what you want. Thank you for the help. As you can tell, my own wackiness interferes with my RPing ability (oy vey). Frank can DEFINITELY react to different situations appropriately. Should I make that more clear in my character sheet? No, it's all ok. As long as he has a way to fit into the RP, he can be whatever you want. Go ahead and be as wacky as you feel like. Also, what's our time-flow compared to the other neighborhoods? But if we're behind he doesn't exist in canon yet. Ah, Ima note to all that Ima going to sleep now, school's tomorrow, and as such won't be replyin' till ~3:30 PM. FYI. Dunno if this is needed. There is an open flow of time. This means things happen in a general order, but the timing of it doesn't matter. To liken it to a video game, Mario goes through all the stages, in order, and then he fights King Koopa at the end. The time it takes him to do this doesn't matter, as long as things stay sequential. In such a world, characters do not age naturally, they just continue on through the years, at whatever age is good for their story, and don't worry about the consequences of passing time, only the actions which they did at some prior point in the time-line. So, as long as K-Bar pops in at a point in his life where it is reasonable, he can come in at any time. However, if he comes in at one point in his life, he cannot come back later at another point which came before it, as that would break the sequence of his events. Understand? Yes. It's courteous when there's posting going on. Night. 2 = Has advanced cancer. 3 = Has a heart condition. 5 = can take a few but won't survive a full on fist fight. 6 = Can take it and dish it. 7 = "What was that? Did you just punch me? Felt nice, do it again". 8 = "Oh hey there, I didn't notice you were punching me". 9 = "Your leg's off." "It's just a flesh wound!" 10 = I think I just got shot in the face. Why don't I feel anything? Edit Too: I'm just trying to gauge the general feeling among the RP community, FYI. Can anybody help me if I'm wrong? Last edited by FunkyChickenFace on Tue Jun 01, 2010 3:54 pm, edited 1 time in total. Neko, lets not do the pm thing because we have a stalker on our hands. Ill post what i sent you on the forums. Zander, Rocky is the most saddening Husky I've ever met. He makes me want to cry and give him a hug and tell him I love him. You should take this as a complement. On a separate note: how many votes for uncovering the @$$ who made Rocky so emotionally scarred and beating the turkey stuffing out of him? I was thinking we could enlist the Chicago Pet Mafia for a hit and have them make it look like an accident. he was abused at an orphanage till he was 2 years old, then he was sold to these people that live up in alaska that do research, they didnt care much for wellbeing of the animals, but they needed someone to lug around all there crap, so they adopted him and sent him to a training camp for sleigh dogs for 3 1/2 years. Right. That settles it. As soon as it's canon-ly possible, I'm going to enlist K-Bar and the Chicago Pet Mafia. We are going to find that orphanage. We will make sure to move the pets inside to good houses first. Then we are going to BOMB the ROAST BEEF out of the place. The Chicago Pet Mafia will insure that it looks like a gas leak and a cigarette lighter had a bad fight. Edit: This is, of course, after we find Rocky a home and feed him until he can't eat anymore. I'ma be off line for the next few hours at a graduation party. FYI. TTYL. I RETURN AGAIN, STILL TRIUMPHANT!!!! I think I'm going to join in for a slice of this action, but I'm bad with RPing, so I may just make a guest character. Only if that's ok with rockstar of coarse.